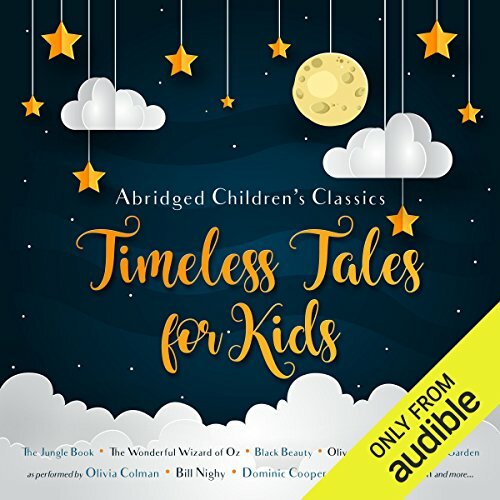 Timeless Tales for Kids is an enchanting compilation of children's classic stories read by an all-star cast. Olivia Colman reads E. Nesbit's classic novel The Railway Children, a masterpiece in children's fiction wonderfully evoking a bygone age, packed with fun, excitement and adventure. Bill Nighy reads a much-loved children's classic, The Wonderful Wizard of Oz, which continues to delight young and old with its enchanting tale of witches, flying monkeys and magical shoes. Dominic Cooper reads Dickens' classic tale Oliver Twist. Dickens' timeless novel transports readers to a Victorian England filled with frightened orphans, grim workhouses and gangs of thieving children. Gemma Arterton reads Lewis Carroll's all-time classic, Alice's Adventures in Wonderland. Alice meets characters like the Queen of Hearts, the Mad Hatter and the Cheshire Cat in a story that has delighted and entranced readers for more than a hundred years. Gemma Arterton reads Alice Through the Looking-Glass.